How did I get a shot like this? Well it wasn't easy. I had to act like I was Jack London and head north towards Alaska. First, I drove a few thousand miles up the Alaska Highway to Whitehorse on the Yukon River. From there I went out a few hundred miles toward Dawson and turned north on the Dempster Highway, which is a gravel road that led me another hundred miles out to the Arctic Circle. I was a long way from the nearest help, but I enjoyed the adventure. I decided that hiking around on the tundra by myself, with the temperature well below zero, was a good way to end up dead, so I stayed pretty close to the road. I tried to always keep my pickup in sight whenever I was out hiking on the tundra. The temperature in October was minus 10 F during the day, colder at night, and everything in my pop up camper was frozen solid. I left water in my tea kettle every night so I could melt it the next morning to make some breakfast. Cooking eggs that are frozen solid is an interesting experience. I ate a lot of pan cakes as the mix was easy to do with the melted ice from my tea kettle. My camper has a small furnace, but it runs the battery down on cold nights and I like my pickup to start in the morning, so I didn't use it often. It took four days of living like this before I saw my first Caribou. The migration to the wintering grounds had started! I spent four more days following the Caribou around. Actually, I tried to be anticipate where they were heading and try to intercept them. They trot a lot faster than they appear to be moving. 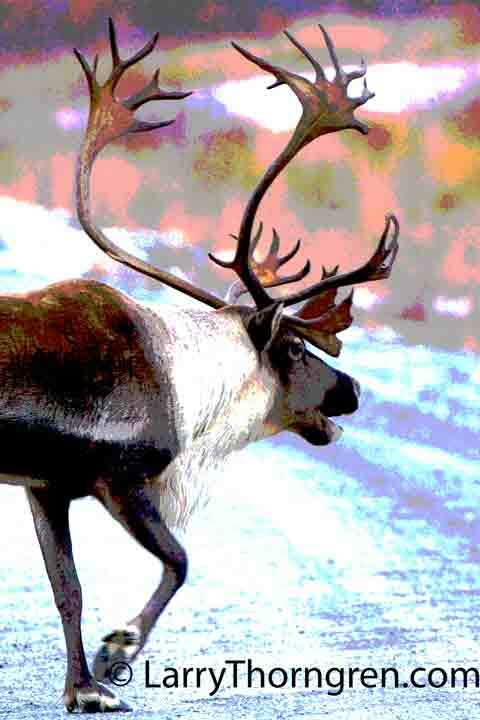 I was seeing the world famous Porcupine Caribou Herd that comes out of Alaska to winter in the Yukon. I didn't see White Fang, but I found lots of Caribou( I saw about six thousand out of the hundred thousand that make up the herd), but most of them avoided the road because there were native hunters out looking for them. I was lucky to get this bull actually crossing the Dempster. I also saw a Wolverine, but it was too fast and too far away to get a photo. I added some saturation to the original photo and posterized it.